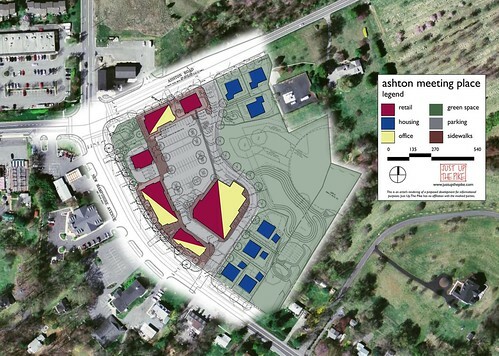 Developer Fred Nichols teamed up with Ashton residents to create this "compromise" plan for the controversial Ashton Meeting Place. The Planning Board reviews their proposal on Thursday. After years of wrestling over how their village center should be developed, a group of Ashton residents and a local developer have come to a compromise on the Ashton Meeting Place, a proposed mixed-use complex on nine acres at the intersection of New Hampshire Avenue and Route 108. On Thursday, the Planning Board will review plans for the once-controversial shopping center mockingly called the "Ashton Mall." 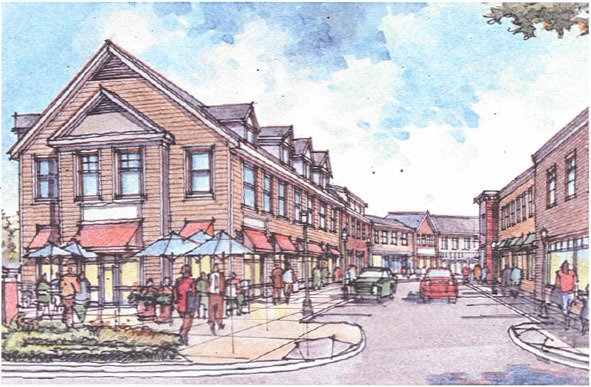 The current design, which grew out of drawings by Brookeville architect Miche Booz and resident Brooke Farquhar, is designed to resemble the low-rise, free-standing buildings that currently line New Hampshire and 108. A line of small buildings containing about 14,000 square feet of retail, 32,000 square feet of office space and a restaurant will hug both streets. They hide a large interior parking lot and a smaller, 18,000 square-foot yet-to-be-named grocery store. At the corner is a green intended to be the literal "meeting place" of the community. In keeping with the property's current mix of commercial and retail zoning, there will be seven new single-family homes. "I think it takes a little imagination, and probably a financial risk," said Farquhar, a planner for the County's Department of Parks, of the compromise plan after its unveiling last summer. A year ago, Just Up The Pike attended a meeting of the Sandy Spring-Ashton Rural Preservation Consortium, whose aim is to "see the area remain rural," according to their website. They've clashed repeatedly with Ashton developer Fred Nichols, whose earlier proposals for the Meeting Place included up to thirteen condominiums, office space, and an approximately 60,000 square foot grocery store. That concept, which would have required an exception from Park and Planning for encroaching on wetlands, was rejected in July as being "out of scale" with the nearly three-century-old village. Very nice article. I especially like the photo/plan combination. You can see SSARPC's side of the story and get some updates at www.ssarpc.org.